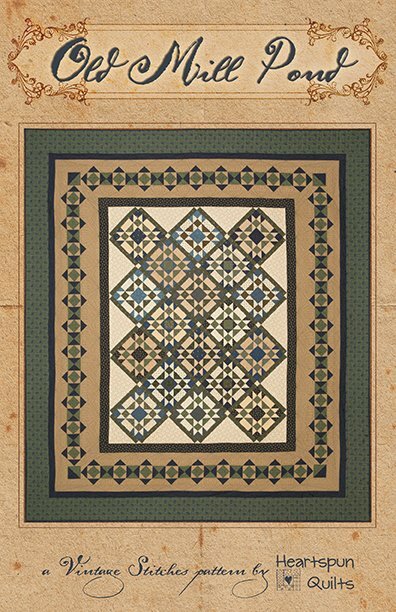 Old Mill Pond is a gorgeous quilt featuring a simply pieced but stunning star block center design, framed by a unique and easy-to-piece border. (Block size is 9 inches.) Made with an array of lovely light prints, and classic prairie style greens and blues, the fabrics and colors do so much with the look of this quilt. I love a quilt that looks more difficult to make than it really is. The cover quilt is made from the Antique Cotton Calicos ~ Old Green Calicos fabric collection, by Pam Buda of Heartspun Quilts for Marcus Fabrics.